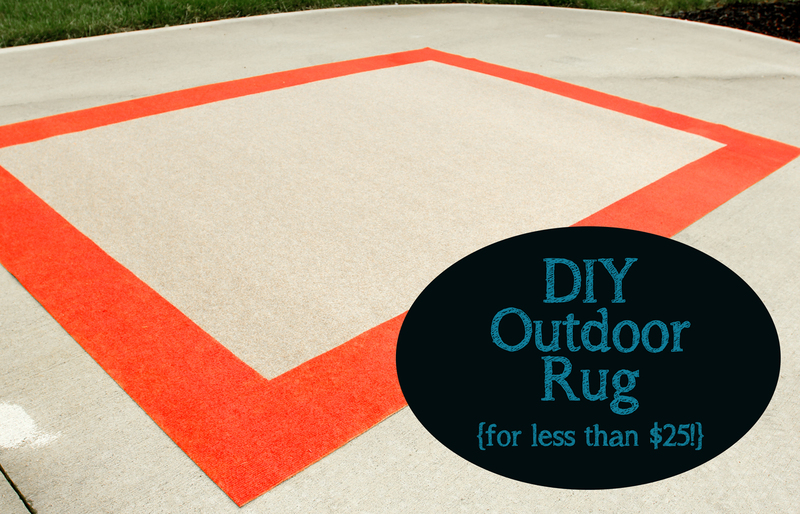 DIY Outdoor Rug for Less Than $25! Yippee for warmer temps and outdoor living. I can’t wait to get outside with the family and host a few outdoor gatherings! Especially since I’ve been working on my screened porch and giving it a little makeover. More on that coming later this week. 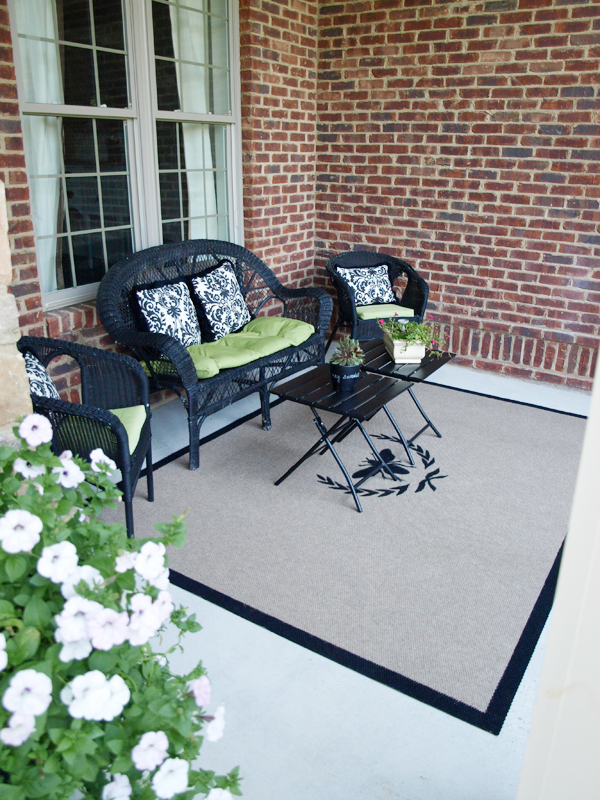 And one of the projects I did for that space is another painted outdoor rug. Remember my bee wreath rug from last year? Well, I loved it so much, I wanted another for my newly-madeover screened porch. And, once again, I ordered one of these fabulous rugs from Home Depot for the job. These awesome rugs are a generous 6’X8′, and still only $17.87! I’ve never seen a better deal on a basic rug. And it’s the perfect choice for adding your own design. They don’t sell these in stores, but the shipping is fast. And don’t forget to use Ebates to order to get an extra 3% cash back along with any available coupon codes! Once your rug arrives, choose your design and get busy! On my latest rug, I wanted a nice wide border, so I taped it off at 8 inches all around with blue painters tape, being careful to smooth it down really well. 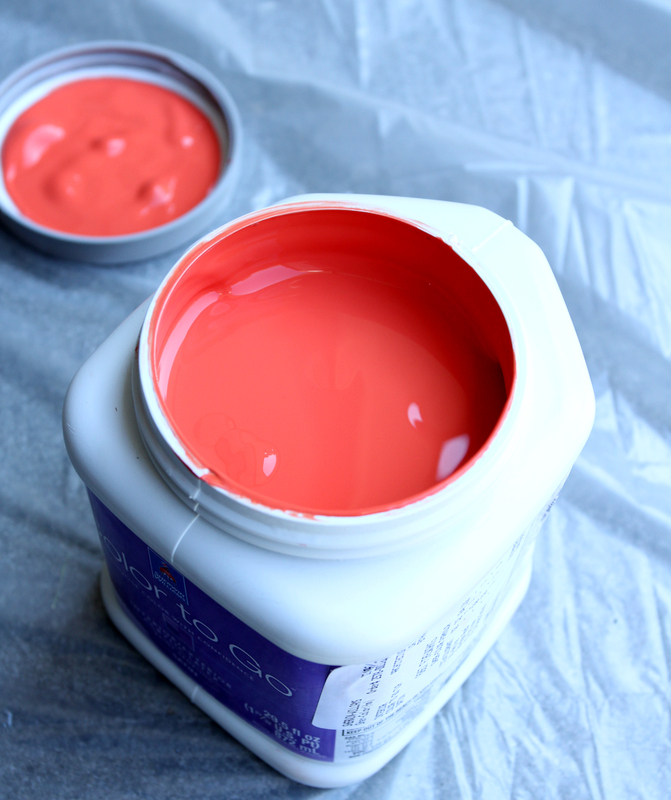 As for paint, I chose Fireworks by Sherwin Williams because it was just the deep coral color I had in mind. Like I do for so many other projects, I just bought a sample quart which was just the right amount for this rug. 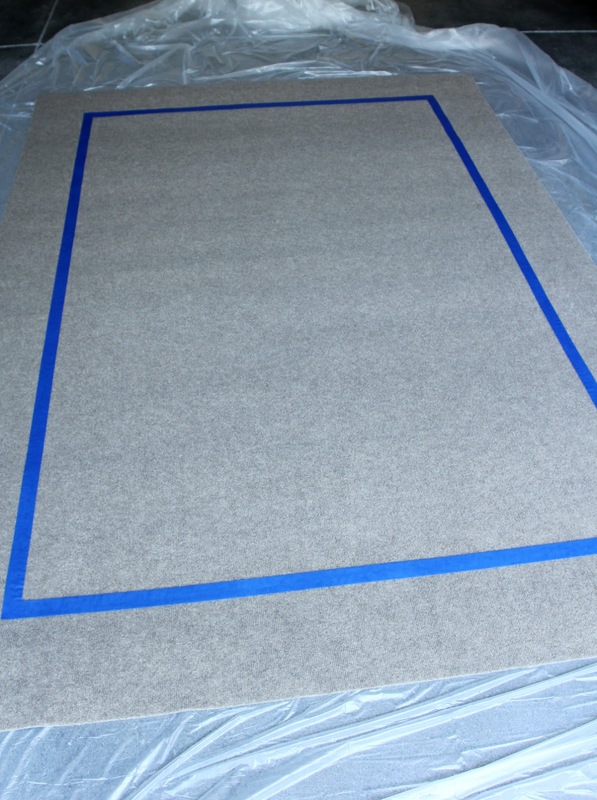 Don’t forget to lay the rug on a drop cloth before painting. 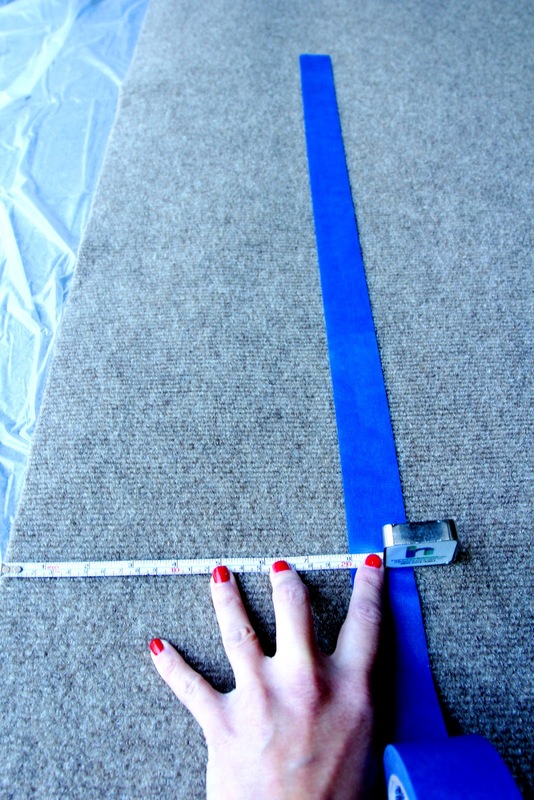 A foam roller does a great job of covering without causing the paint to saturate the rug. Because I’m not very patient, the hardest part of the project for me is waiting overnight for the paint to dry. The reveal of the porch is coming later this week! If you make one of these rugs, I’d love to see it. Email me your pics and I may feature them in a future post! I’m sharing this one with a few of these parties. Check them out! This entry was posted in Uncategorized and tagged Outdoor Decorating, Painting, Rugs, Screened Porch. Bookmark the permalink. Follow any comments here with the RSS feed for this post. Post a comment or leave a trackback: Trackback URL. Great idea! Thanks so much for sharing!! Ooo, looking forward to the big reveal. Loved the Bee motif from last year, remember it well. I remember the bee too! Love this one! I love the rug and the color you chose. Can't wait to see it all together for the big reveal. Great tip!! Thanks! I have been trying to figure out how to make a rug for outside… I will have to check if HD sells these in Canada, thanks again! Love your new rug! Nice work 🙂 Thanks for linking up to Monday Funday! Love this idea. But I, too, am wondering how the paint holds up with water/rain, as well as foot traffic. What is your experience from the first one? Looking forward to making this! My first one is still looking like new. Since it's on my porch, it doesn't get full exposure to the elements, but it gets some. I even left it out through the winter & it's holding up well. Hope that helps you! I'm wondering what type of paint you use? Sorry I should have specified I'm wondering,latex,acrylic? Thank you so much, I already ordered my rugs I can't wait to see how they turn out! Great!! Have fun with them! Oh my goodness!! You just saved my life… I have been searching for the perfect outdoor rug for the PERFECT price… and have struck out more than 3 times…. I just ordered 2 of these rugs and cannot wait to do this project!!! Thank You for sharing!!! You've totally made my day! I've been looking for a rug to put under the dining room table. I haven't been able to find anything that i like in my price range. I finally decided that I'll probably have to "make" one. Do you know if this rug can be cut to size? That's great! Glad I could help. I'm not positive about the cutting to size, but I think it's a possibility! Maybe HD themselves could answer for you. Wow great idea! And thank you for the link to the rug!!! Can you tell me if the painted part is comfortable to walk on with bare feet? Or is it pretty hard and pokey?